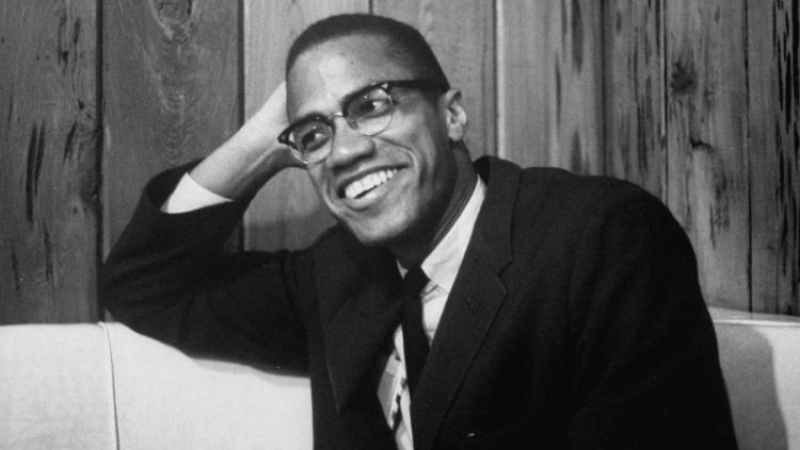 Malcolm X: Well, he represented himself to us as a prophet who had been visited by God, who had been taught by God, who had been given an analysis of the problems concerning black people in America by God, and also a solution by the same God, and as long as I believed in him as a man, I actually thought that he had been taught and commissioned by God to solve the problems of our people in America. Then I came into the knowledge of something in his own personal life that he admitted to me when I confronted him with it. But when it came to him taking the steps that a man would take to correct this mistake, I found that his own ability to be a man was lacking. Hence I ceased to respect him as a man, I could see that he also was not divine. There was no God with him at all. Berton: I take it you don’t want to discuss this specific thing in his personal life? Malcolm X: Well, discussing it might keep your show from going on the air. Berton: All right, we won’t discuss it; but there seemed to me at the time that there were other reasons given for your break with Elijah Muhammad. At the time of President Kennedy’s assassination, you made a speech that seemed to indicate that you were pleased that he had been assassinated. Certainly at that time, Elijah Muhammad indicated that you had been fired or suspended from the Black Muslim movement. How about that? Malcolm X: I had taken a subject as my topic that day, an approach that was designed to show that the seeds that America had sown—in enslavement, in many of the things that followed since then—all of these seeds were coming up today; it was harvest time. At the end of this particular lecture, during the question-and-answer period, somebody asked me what I thought of the assassination of President Kennedy. In line with the topic that I had just been discussing, I pointed out that it was a case of the chickens coming home to roost, by which I meant that this was the result of seeds that had been sown, that this was the harvest. This was taken out of context, and reported in one of the papers, and Elijah Muhammad, who had been waiting for me to make a move that would enable him to suspend me and get the support of the public in doing so, took advantage of that opportunity. He gave the impression that I was saying something against the president himself because he felt that the public wouldn’t go along with that. Berton: How did you feel, personally, about the president’s assassination in that connection? Were you bothered about it? Were you angered by it? Or were you jubilant? Malcolm X: No. I was realistic, in that being at the forefront of this struggle of the black man in America—in his quest for respect as a human being—I had seen the many-faceted repercussions of this hate taking a grip on the American public. I think that many of the politicians took advantage of it and exploited it for their own personal benefit. So to me the whole thing was a case of politics, hate and a combination of other things. Berton: There seems to me to have been a fair amount of hate in the Black Muslim movement itself. Malcolm X: Well, I won’t deny that. But, at the same time, I don’t think that the Black Muslim movement and its hate can be classified as the same degree or type of hate you find in the American society itself, because the hate, so-called, that you see among black people is a reaction to the hate of the society which has rejected us. In that sense it is not hate. Berton: I’m not saying that the hate, or whatever it is, isn’t understandable. I’m asking if it’s effective to fight hate with hate? Malcolm X: In my opinion, I think that it is not fair to classify the reaction of people who are oppressed as hate. They are reacting to the hate of the society they have had put upon them or practiced against them. Berton: Let me ask you this about your God, Mr. X. Has he got any color? Is he black? 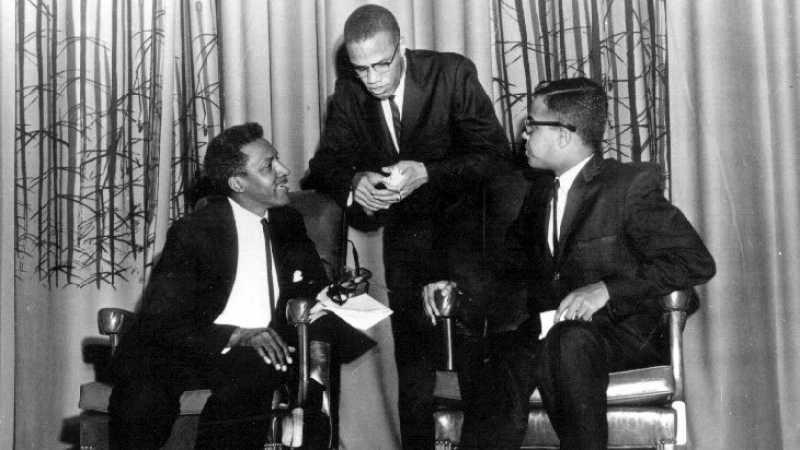 Malcolm X: As a Black Muslim, who believed what Elijah Muhammad taught, I regarded God just as he taught, as a black man. Having since gone into the Muslim world and got a better understanding of the religion of Islam, I believe that God is the supreme being, and that color plays no part in his particular being. Berton: In fact, isn’t the God of the Muslims and of the Jews and the Christians really the same God? Malcolm X: If they believe in the God who created the universe, then we all believe in the same God. I believe in the God who created the universe. Muslims call him Allah. Christians, perhaps, call him Christ, or by some other name. Jews call him Jehovah, and in referring to him they mean “the creative.” We are all referring to the same God. Berton: Now, let me switch the subject briefly, and ask you what you mean when you say that the Black Muslims are not militant enough. Your new organization, I take it, will be more militant than the Black Muslims. In what way? Malcolm X: Well, the Black Muslim movement, number one, professes to be a religious movement. They profess the religion of Islam. But the Muslim world rejected the Black Muslim movement as a bona fide Islamic group, so it found itself maneuvered into a religious vacuum—or a sort of religious hybrid. At the same time, the government of the United States tried to maneuver the Black Muslim movement, with the press, into an image that was political instead of religious. So the Black Muslim movement came to be known as a political group. Yet, at the same time, it didn’t vote; it didn’t take part in any politics; it didn’t involve itself actively in the civil rights struggle; so it became a political hybrid as well as a religious hybrid. Now, on the other hand, the Black Muslim movement attracted the most militant black American, the young, dissatisfied, uncompromising element that exists in this country—drawing them in yet, at the same time, giving them no part to play in the struggle other than moral reform. It created a lot of disillusion, dissatisfaction, dissension, and eventually division. Those who divided are the ones that I’m a part of. We set up the Muslim Mosque, which is based upon orthodox Islam, as a religious group so that we could get a better understanding of our religion; but being black Americans, though we are Muslims, who believe in brotherhood, we also realized that our people have a problem in America that goes beyond religion. We realized that many of our people aren’t going to become Muslim; many of them aren’t even interested in anything religious; so we set up the Organization of Afro-American Unity as a non-religious organization which all black Americans could become a part of and play an active part in striking out at the political, economic, and social evils that all of us are confronted by. Berton: That “striking out,” what form is it going to take? You talk of giving the Ku Klux Klan a taste of its own medicine. This is in direct opposition to the theory of non-violence of Dr. Martin Luther King, who doesn’t believe in striking back. What do you mean by “a taste of its own medicine”? Are you going to burn fiery crosses on their lawns? Are you going to blow up churches with the Ku Klux Klan kids in them? What are you going to do? Malcolm X: Well, I think that the only way that two different races can get along with each other is, first, they have to understand each other. That cannot be brought about other than through communication, dialogue—and you can’t communicate with a person unless you speak his language. If the person speaks French, you can’t speak English or German. Berton: We have that problem in our country, too. 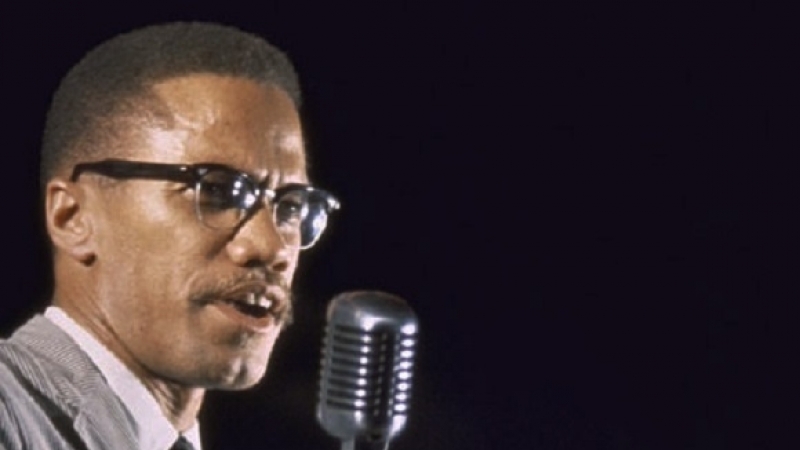 Malcolm X: In America, our people have so far not been able to speak the type of language that the racists understand. By not speaking that language, they fail to communicate, so that the racist element doesn’t really believe that the black American is a human being—part of the human family. There is no communication. So I believe that the only way to communicate with that element is to be in a position to speak their language. Berton: And this language is violence? Malcolm X: I wouldn’t call it violence. I think that they should be made to know that, any time they come into a black community and inflict violence upon members of that black community, they should realize in advance that the black community can speak the same language. Then they would be less likely to come in. Berton: Let’s be specific here: suppose that a church is bombed. Will you bomb back? 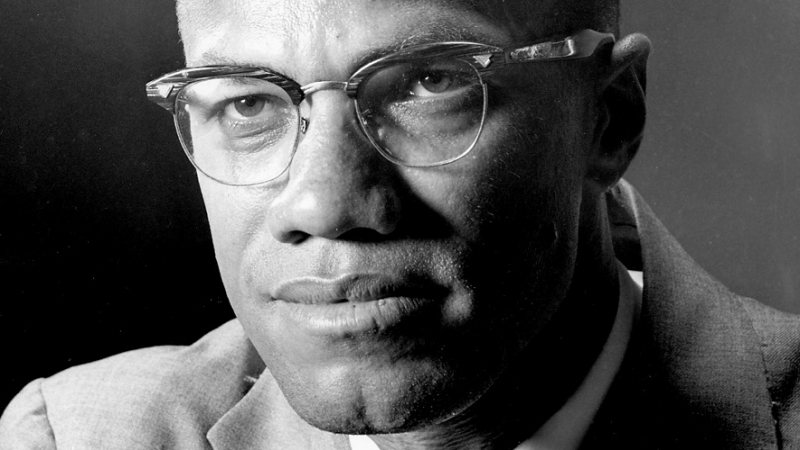 Malcolm X: I believe that any area of the United States, where the federal government has shown either its unwillingness or inability to protect the lives and the property of the black American, then it is time for the black Americans to band together and do whatever is necessary to see that we get the type of protection we need. Malcolm X: I mean just that, whatever is necessary. This does not mean that we should go out and initiate acts of aggression indiscriminately in the white community. But it does mean that, if we are going to be respected as human beings, we should reserve the right to defend ourselves by whatever means necessary. This is recognized and accepted in any civilized society. Berton: There are some people going to go on trial in Mississippi for the murder of three civil rights workers. There are some witnesses who identify them as murderers, but the general feeling is they’ll get off. Will you do anything about this if they get off? Malcolm X: I wouldn’t say. Berton: You don’t want to say? Malcolm X: Because, then, if something happened to them, they would blame me. But I will say that in a society where the law itself is incapable of bringing known murderers to justice, it’s historically demonstrable that the well-meaning people of that society have always banded together in one form or another to see that their society was protected against repetitious acts by these same murderers. Berton: What you’re talking about here is a vigilante movement. Malcolm X: There have been vigilante movements forming all over America in white communities, but the black community has yet to form a vigilante committee. This is why we aren’t respected as human beings. Berton: Are you training men to use aggressive methods? Are you training men as the Black Muslim movement trained the elite core known as the Fruit of Islam? Have you got trainees operating now who know how to fight back? Berton: Who know how to use knuckle-dusters and guns? Malcolm X: Yes, oh yes. The black man in America doesn’t need that much training. Most of them have been in the army–have already been trained by the government itself. They haven’t been trained to think for themselves and, therefore, they’ve never used this training to protect themselves. Berton: Have you got a specific cadre of such young, tough guys working for you or operating under your aegis? Malcolm X: We’re not a cadre, nor do we want it to be felt that we want to be tough. We’re trying to be human beings, and we want to be recognized and accepted as human beings. But we don’t think humanity will recognize us or accept us as such until humanity knows that we will do everything to protect our human ranks, as others will do for theirs. Berton: Are you prepared to send flying squads into areas where the Negroes have been oppressed without any legal help? Malcolm X: We are prepared to do whatever is necessary to see that our people, wherever they are, get the type of protection that the federal government has refused to give them. Berton: Okay. Do you still believe that all whites are devils and all blacks saints, as I’m sure you did under the Black Muslim movement? Malcolm X: This is what Elijah Muhammad teaches. No, I don’t believe that. I believe as the Qur'an teaches, that a man should not be judged by the color of his skin but rather by his conscious behavior, by his actions, by his attitude towards others and his actions towards others. Berton: Now, before you left Elijah Muhammad and went to Mecca and saw the original world of Islam, you believed in complete segregation of the whites and the Negroes. You were opposed both to integration and to intermarriage. Have you changed your views there? Malcolm X: I believe in recognizing every human being as a human being, neither white, black, brown nor red. When you are dealing with humanity as one family, there’s no question of integration or intermarriage. It’s just one human being marrying another human being, or one human being living around and with another human being. I may say, though, that I don’t think the burden to defend any such position should ever be put upon the black man. Because it is the white man collectively who has shown that he is hostile towards integration and towards intermarriage and towards these other strides towards oneness. So, as a black man, and especially as a black American, I don’t think that I would have to defend any stand that I formerly took. Because it’s still a reaction of the society and it’s a reaction that was produced by the white society. And I think that it is the society that produced this that should be attacked, not the reaction that develops among the people who are the victims of that negative society. Berton: But you no longer believe in a Black State? Malcolm X: No. I believe in a society in which people can live like human beings on the basis of equality. Berton: So you have been changed considerably by your visit to the Muslim world and specifically to Mecca. Did this produce violent emotions within yourself? When people lose their faith or change their faith or renew their faith, they usually suffer terrible internal conflicts. Malcolm X: Oh, yes. I will confess readily that it’s impossible to believe as strongly in a man as I believed in Elijah Muhammad and have him disappoint me—or disappoint anyone else for that matter—and not create a great deal of internal conflict. One of the things that I am thankful for about the religion of Islam is that it is sufficiently strong in itself so that when one broadens one’s understanding of it, it gives one the inner strength to face up to some of these crises or tests that one encounters. Berton: There has been talk, I think by you and by Elijah Muhammad, about an Armageddon in the United States by 1984. I’m wondering if you still believe that, and why that particular date? Malcolm X: I don’t frankly. Much of what Elijah Muhammad has taught I don’t think he believes in himself. I say that and can easily defend it sitting opposite him. But, where an ultimate clash between East and West is concerned, well, I think that an objective analysis of events taking place on this earth today points towards some type of ultimate showdown. You can call it a political showdown or even a showdown between the economic systems that exist on this earth, which almost boil down along racial lines. I do believe that there will be a clash between East and West. I believe that there will ultimately be a clash between the oppressed and those that do the oppressing. I believe that there will be a clash between those who want freedom, justice, and equality for everyone, and those who want to continue the systems of exploitation. I believe that there will be that kind of clash, but I don’t think that it will be based upon the color of the skin, as Elijah Muhammad has taught it. However, I do think you’ll find that the European powers, which are the former colonial powers, if they’re not able to readjust their feeling of superiority towards the darker skinned people, whom they have been made to think are inferior, then the lines can easily be drawn. They can easily be lumped into racial groups, and it will be a racial war.